Scooper - Technology News: Which are the world's most environmentally friendly countries? 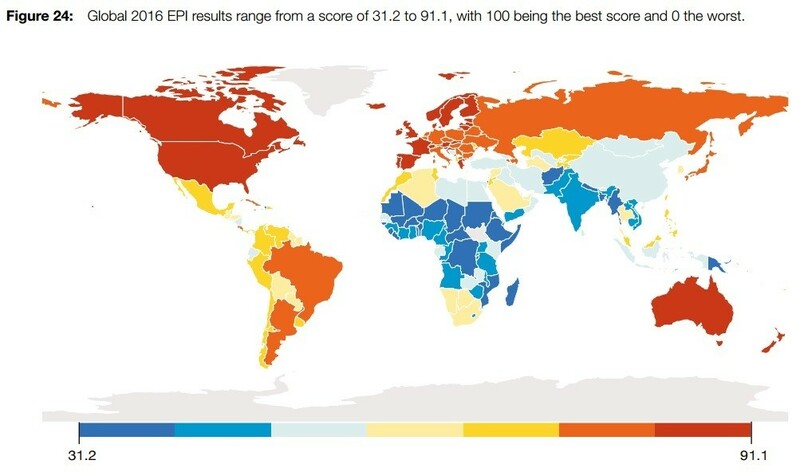 Which are the world's most environmentally friendly countries? Nordic nations often appear at the top of rankings for the world’s greenest places, so the countries dominating Yale's Environmental Performance Index (EPI) will come as no surprise – with the exception of Norway, which is lagging behind in 17th place. Since 2000, Yale’s annual index has ranked the top-performing countries for the environment, based on how well they've fared at protecting human health and vulnerable ecosystems. It looks at a number of specific metrics to give each country a score out of 100. European nations top the list, with Finland, Iceland, Sweden and Denmark taking the first four places. The report says Norway lags behind its neighbours because of poor agricultural practices and high carbon emissions. Are countries getting better at protecting the environment? Since the EPI started, several countries have made improvements to a number of environmental and social issues, such as access to clean drinking water and sanitation. However, fish stocks have dwindled and air pollution has become worse since the index began. Finland has made a "societal commitment to achieve a carbon-neutral society that does not exceed nature's carrying capacity by 2050". This is reflected in its position at the top of the rankings – with high scores for health impacts, fish stocks, climate and energy, biodiversity and habitat, water resources and air quality. With 100% of Iceland's electricity and heat coming from renewable sources , it’s no surprise the nation ranked highly – with a score of 90.51. Iceland was also third for health impacts, as well as climate and energy, and fourth for air quality: meaning they came second in the index overall. Sweden came third, scoring 90.43, ranking fifth in health impacts, 10th in climate and energy, and in the top 20 for both sanitation and water resources. The country earned near perfect scores for drinking-water quality and waste-water treatment, but it was marked down for poor logging practices. In order to support environmental protection along with economic growth, Denmark (in fourth place) has pledged 13.5 billion Danish krone (approximately US$1.9 billion) to its Green Growth initiative . Denmark scored 89.21 overall, ranking in the top 20 for health impacts, water and sanitation, water resources, biodiversity and habitat. However, at 128 for fish stocks, Denmark still has areas to work on. Slovenia was let down by air quality, with common pollutants including nitrogen dioxide and particle pollution PM2.5 continuing to pose problems. However, with eighth place for biodiversity, 15th for forests, and the top spot for habitat, Slovenia scored an impressive 88.98 in the index. While economically developed countries are more likely to achieve higher scores in the EPI rankings, the UK and France are the only G8 countries in the top 20. The report says larger developing economies, such as China, which is ranked 109, are often let down by poor air quality as a result of industrial production. Have you read? Will China become a global environment leader? Which countries do the most to protect the environment? Could energy be 100% green by 2030?